For those of you who’ve been avidly following CoinPot’s rise to become one of the most popular microwallets around, the sudden closure of its Bitcoin Cash faucet, located at moonb.ch, came as a bit of shock. Many people were concerned that it had either gone scam or had simply closed down overnight, but fortunately for all the avid faucet visitors out there, this was not the case. This came as a relief to the thousands of people who regularly claim from this faucet, but drew criticism that the announcement wasn’t also posted on the homepage of the former home of the faucet. Visitors were simply presented with an error message and no other information. This aside, the new faucet is up-and-running and is operating exactly as the old one did. And importantly, as the CoinPot statement read, all previous bonuses, referrals and earnings remain intact. There’s no explanation as to why the URL was changed, but perhaps it’s because the new one is so easy to remember, but it’s now business as usual. Another recent development at CoinPot was the introduction of CoinPot Tokens and lottery. You receive free tokens every time you claim from a faucet, or one of your referrals does. You can also mine them by selecting CoinPot Tokens on the homepage and clicking ‘mine’ on the next screen. At the moment you can either convert your tokens into bitcoin (or any other of the coins supported by CoinPot) or use them to buy tickets for the CoinPot lottery, which features an hourly draw. One token buys one ticket for the draw, which offers some reasonably sized prizes depending on how many people play each round. CoinPot has said that at some point in the future members will be able to redeem tokens against vouchers or even use them to buy in-game credit. But the details are sketchy so watch this space! There is absolutely no cost involved and you’ll be earning within minutes. The reason faucets give away free coins is because they earn money from advertising. The payout to you incentivises you to keep on visiting to drive the faucet’s traffic up and keep their revenue flowing. Microwallets are used to collect all these tiny Satoshi-level payments together into one larger, usable pot which can then be draw out into your bitcoin wallet to be spent or held as an investment. If you’re looking for a bitcoin wallet then Coinbase is a good option. It’s the largest wallet operating at the time of writing and offers a very user friendly interface through which to buy and sell coins. At present it supports Bitcoin, Bitcoin Cash, Ethereum and Litecoin. 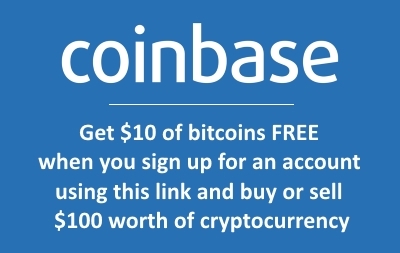 If you sign up using our referral link and go on to buy or sell $100 of cryptocurrency or more you’ll earn $10 worth of free bitcoins (and so will we).